The seeing wasn't very good last night, due to thin clouds in the upper atmosphere. Nonetheless, I was able to see the supernova briefly. It might or might not be as bright as I've depicted here, but with patience, you should be able to find it. Drawn with 2B and 4H pencils on Canson drawing pad, then processed with GIMP 2.8. Very nice. I have been wanting to get out and image it, but the weather here has not been cooperating. The Clear Sky Chart showed clear sky for last night, but it was completely clouded over. Nice sketch capturing it and thanks for the heads up Roy! 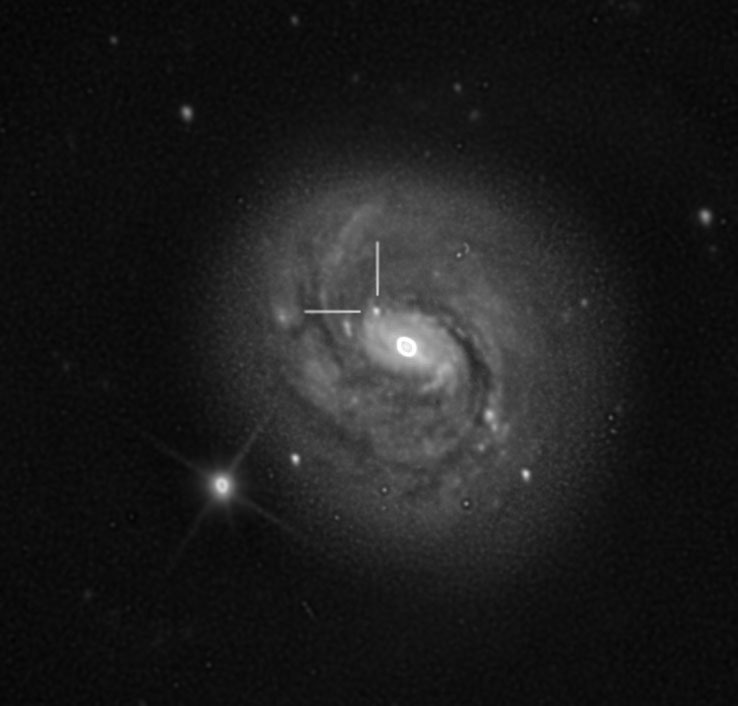 Excellent capture of the supernova in M 77. 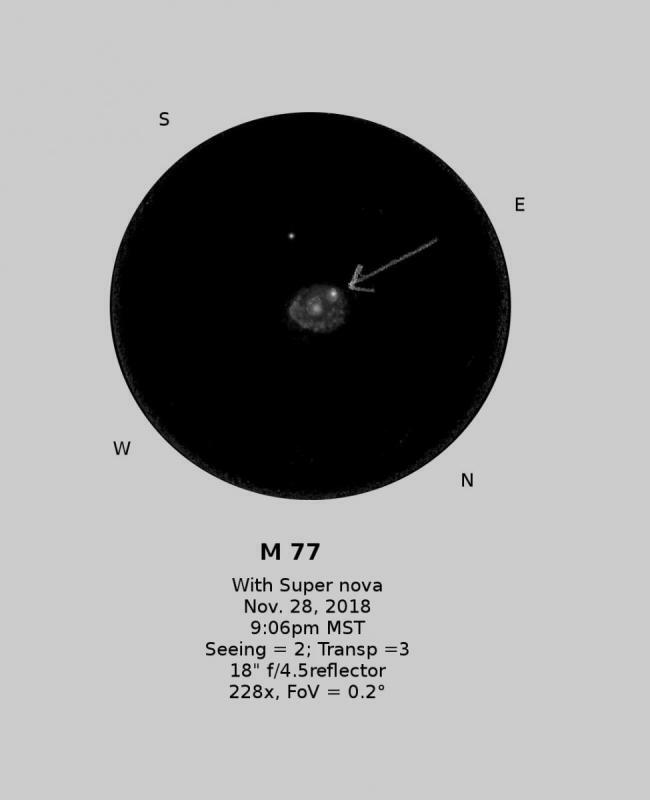 Nice sketch of Supernova (In M-77) . Looked for it last night in my 12” sct and couldn’t break it out. Man, I gotta hurry to see this. Maybe tonite. Thanks, Roy. I could see the SN in a 40 cm scope of a friend (with averted vision). In my own 30 cm visibility was doubtful. Bortle 6 sky. Nice work Roy. So it was brighter t h an the Seyfert Nucleus? I'm not sure, because the galaxy kept fading in and out, due to the wispy clouds that were beginning to form. I plan to make another drawing, under clearer conditions. This image of M77 was taken last night (12/6/2018), based on just two 900 second luminance images in less than ideal seeing. "Quick and dirty" processing could be better since the galactic core is washed out. Scope is a 16" Astrotech R-C, with SBIG STXL 16200 camera and AO-X adaptive optics. But I did manage to image it with the 10". 900 Sec exposure with a bit of colour thrown in.